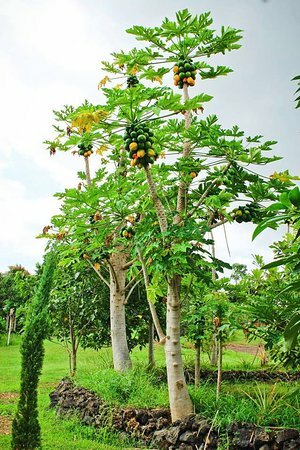 Carica Papaya is a tree native to southern region of North America and the northern parts of South America. Papaya grows from 10 to 20 feet and it sparsely has any branches. It grows in loamy soil with a lot of sunlight and in tropical climates. It produces a delicious melon like and edible fruit that ranges from green to orange on the outside and orange of the inside.